When I first smelled these melts, I about moaned right there… it was so yummy and realistic. I’m pretty sure I bought everything my store had… that’s how much I liked it. There was nothing fake or chemically about this scent… just pure and rich bakery goodness. I’m constantly blown away by how authentic Better Homes and Gardens bakery scents have been. I sometimes even think they smell better than the real deal. 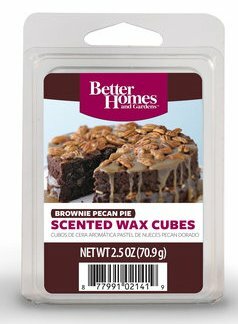 I’ve baked plenty of cookies and cakes that don’t smell near as delicious as some of this scented wax does. Brownie Pecan Pie smelled like the most amazing pecan pie/cake on the planet. You want to eat the wax, it smells that wonderful!! Moutwatering!! Oh my goodness – the fragrance is so rich and warm – you want to eat it with a big glass of milk! I used the entire clamshell pack (3 cubes each) in two electric melters in my great room and within minutes of putting the wax in my melters… the fragrance was everywhere. By the time the wax fully melted… room saturation. AMAZING!!!! If you love bakery scents… this is an absolute must have! I couldn’t find a scent description for this one but the picture on the label says it all… thick and rich brownie pecan cake. The chocolate is very light but perfect – so authentic… the cake, WOW!! 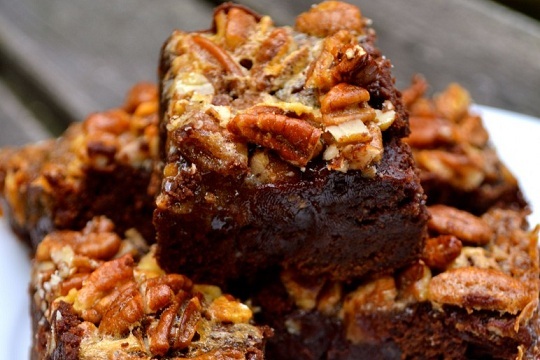 It’s buttery and moist with the perfect hints of pecans drizzled in sugary frosting. So so SO good!!!!! And believe it or not, it gets better and better the longer it melts. It becomes more buttery and moist and soooooooooo cake’y and delicious. Can you tell how much I am loving this scent? Every time I go to Walmart, I’m buying multiples of this one… it’s THAT good and a fragrance I always want to have on hand. Go buy it!! It’s pure YUM!!!!! Visit Walmart to buy this YUMMY scent! Buttery yummy and rich - mouth watering cake scent you will LOVE if you are a fan of bakery scents. I agree with this review. These melts are the BEST! Buttery cake is what it smells like. Not so much chocolate but sweet buttery cake. I could eat it.